Why Should You Build a CAD Model of Your Actuator? An effective actuator is one that fits and performs precisely in a given application. In this context, precision refers to how well the actuator achieves the force and speed the application requires and to the precision of the actuator’s manufacturing. In other words, a precise actuator functions and fits as intended within the system for which it is designed. An actuator designed using computer-aided design (CAD) software will be perfectly suited to its task. CAD models eliminate uncertainty about the fit and accuracy because they provide the most detailed rendering possible of the engineer’s intended design of the actuator. CAD models provide the most detailed portrait of the system within which the actuator will function. This helps designers and engineers complete projects faster because all the relevant dimensions are present in the design context. CAD modeling also allows engineers to identify design or fitment issues early and easily, eliminating the need for expensive redesign and rework that can cause project budgets to balloon unexpectedly. This enables the user to make simple “apples-to-apples” comparisons between different configurations. Dimensions can be confirmed to the manufacturing tolerances, in some cases within a fraction of a millimeter, ensuring that the actuator mates appropriately with the larger device or machine for which it is intended. As a result, the engineer or implementer can be confident that the actuator presented in their chosen CAD software format will match exactly the actuator specified to meet the application requirements. 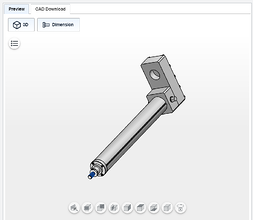 Hunt Valve Actuator Division offers a 2D and 3D CAD portal through their online product configurator to simplify our customers’ design processes.This easy-to-use tool allows a designer or engineer to specify an actuator’s parameters through a short series of drop-down menus and fill-in questions to generate a valid part number. The options chosen for each field will determine choices available in the subsequent fields. This configurator tool also includes several verifications that prevent users from specifying an invalid configuration accidentally. When all the options are chosen, a checkmark verifies that the actuator configuration is valid. Hunt Valve’s product configurator is a valuable, time-saving tool for the modern engineer. To get started, simply click below and begin to configure a rod-style or rodless electromechanical actuator.